You can't miss out on this fantastic little exclusive! See website for details. Act fast - apply this code at checkout for any order and save 20% instantly! The Works has huge savings for you, with 15% off orders! Save big on The Works sales! Get kids books ten for £10. Get instant savings with this special offer from The Works! Get adult fiction books six for £10. Calendars Now: 2 For £5 Today! Celebrate the savings on calendars from The Works now! Storage Boxes Now: 2 For £10 Today! Enjoy deep discounts on storage boxes from The Works now! Shop The Works with this voucher & grab the savings on kids DVDs! Keep the kids happy with the latest VD titles from The Works! Grab this great deal from The Works: Education books now: 6 for £10. Find a wide selection of art and craft products when you shop this online offer from The Works. Deals so good you can't pass them up! Art materials now: 4 for £10. Do you spend a lot of time driving? Shop this online offer from The Works to find the perfect audio book to help your driving time pass by quickly. Buy and save now: 3 for £10. Looking for a great birthday gift, shop this online offer and make your money go further with The Works! Fiction Books Now: 6 for $10. Shop this exclusive offer from The Works! Presents Now: 2 for £10. Shop this online offer and make your money go further with The Works! Kid's Books Now: 10 for £10. Discover great deals with this online offer from The Works! Children's books Now: 3 for £10. Get instant savings with this special offer from The Works! Special Offers. A whole host of items such as games, comics, books, accessories and activity books are all offering special deals at The Works. Shop The Works with this voucher & grab the savings off gifts today! Time to start thinking about Christmas gifts for the children. Get instant savings on toys and games with this special offer from The Works. Shop The Works with this voucher & grab the savings off stationary products today! Discover amazing selection of Halloween items at The Works Arts and Crafts. Get great deals on books from The Works! 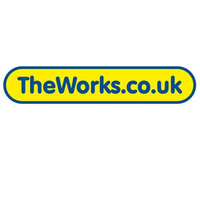 The Works is the UK’s leading retailer of discounted books, as well as a wide range of art and craft materials, toys, games and stationery. This is the perfect place to pick up a bargain on all your favourite reading material, whether you’re into crime fiction, fantasy, romance or the classics. You can even get great deals on kids’ picture books, pop up books, young adult fiction and academic course books, you’ll even find colouring books here. The Works began life as a discount book retailer, Remainders Ltd, in 1981, rebranding to become The Works in 1981. The Works was acquired by private equity firm, Endless LLP in May 2008, establishing The Works Stores Ltd. Following the acquisition, Endless partnered with retail entrepreneur Anthony Solomon to transform the business. Working with the management team has firmly established The Works as the leader in its category, a category that extends further than being just a discount bookstore. The Works is now firmly established as a family friendly discount alternative to full price specialist retailers of gifts, arts, crafts, hobbies, stationery, toys and books. This has been achieved by focusing on the core principles of securing the best products at the best prices, which it sells via its accessible network of stores, and online via TheWorks.co.uk. The Works continues to expand, both geographically, adding new stores to its network across England, Scotland, Wales, Northern Ireland and Eire and by expanding its multichannel offering via its website. Groupon is delighted to team up with The Works to offer you books, art supplies and other gift ideas for less. What Can I Get at The Works? The Works stocks an extensive range of books on all subjects and popular fiction of all genres under its roof, with something to cater for every taste. The fiction section includes a wide selection of crime fiction, from such stalwarts as Ian Rankin, Patricia Cornwall and Mark Billingham, as well as new masters of crime for you to seek out. Fantasy is also one of the most popular genres at the moment, and you’ll find books from all your favourite authors, from George R.R. Martin to Philip Pullman, from Lord of the Rings to Harry Potter. Some of us grew up with Harry Potter, and you’ll find a wide range of future children’s classics on offer, as well as old favourites from when you were a kid. There is in addition a wide range of games and toys on offer, from such classics as Monopoly, Snakes and Ladders and Play Dough, to the latest film and TV tie ins. Being a kid isn’t all fun and games of course – when it comes to exam time, The Works stocks course books and past papers to steer your kids to success. You’ll also find a full range of discounted stationery to ensure that al that work stays organised and looks presentable. If you’re feeling creative, The Works also stocks a full range of paints, including acrylics, oils and watercolours, as well as budget canvases of all sizes to display your work. What Deals at The Works Do Groupon Have? At Groupon we’re always getting the latest updates on the best promotions and deals at The Works. This means we update our site daily, which keeps us on our toes, as their offers are always changing. We’ll always have money-off offers, as well as other promotions to help make the most of the great deals available at The Works, so make sure you visit our site regularly. How do I use my chosen The Works discount code? When you find a discount code for The Works that you wish to redeem, it couldn’t be simpler. All you need to do is click on the voucher, which we load, activating the deal for you. Once you’ve clicked on the deal, just click ‘Shop Now’, which takes you straight to The Works’ website. Browse the site to find what you want, and when you go to checkout to pay, your code will be there waiting for you. It really couldn’t be easier! Here at Groupon we like to keep our deals fresh so we can be found our updating our offers on a on an almost daily basis because we can get new deals from The Works at any time. Some offers might last on the site for only a day or two, for instance during a flash sale, or if deals sell out due to demand. Other deals will last for longer giving you lots of opportunities to save. Check the bottom left hand corner of a deal to see if an expiry date is listed, if there is one be sure to use that deal before the expiry date. Why do you list expired deals here? If you look under the active coupons, there’s a section of expired coupons which are still kept on site; sometimes these may have been extended by The Works due to popular demand, so it’s worthwhile checking to see if they’re still valid. You might pick up a bargain before it’s finally gone! Do Groupon host other offers on books? Groupon don’t only have great deals on books and other reading material with The Works– we also work with other bookdealers to find you the best deals on your choice of books. Abebooks are world leaders in supplying second hand and rare books – alternatively, you could try Alibris books, who provide a similar service, but with the addition of CDs, vinyl and DVDs.